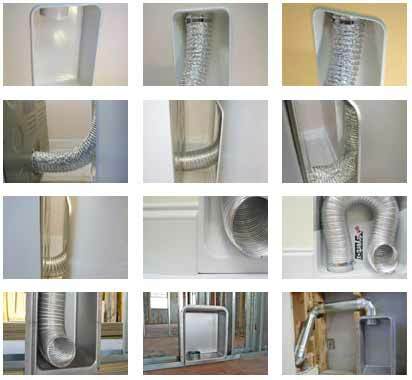 The Dryerbox® is a simple, UL classified metal receptacle that collects flex exhaust hose neatly and safely in the wall behind the dryer. Allowing the homeowner to place the dryer flush against the wall, it lessens the risk of lint buildup, provides energy savings by removing the kinks usually found in the flex hose, and it makes the laundry room look and feel larger—gaining two square feet of living area. For the builder, it gains six feet of duct run, minimizes service calls and is approved for a one hour wall. Thank you for your interest in Press Resources from the inventors of the Dryerbox®. The tabs above lead to press quality resources which are available for use under In-O-Vate Technologies' standard press usage agreement. Of course, we would be delighted to provide custom materials as well as access to engineers, press resource personnel and even the inventor of the Dryerbox®, Dryer-Ell and LintAlert. Please feel free to contact Todd Peach at 888-443-7937 for assistance. If you find the resources here useful or have recommendations for improvements, please let us know. Thank you again for researching the Dryerbox®. We look forward to being of service.